Source: U.S. Energy Information Administration, reproduced with permission from Statoil. 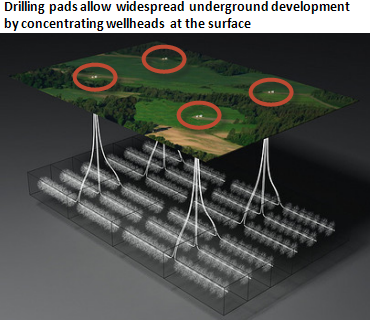 Note: Three-dimensional representation of oil or natural gas development of a large underground area, from four drilling pads on the surface (depicted within the red ovals). Developments in drilling methods and technology are leading to efficiency gains for oil and natural gas producers. For example, "pad" drilling techniques allow rig operators to drill groups of wells more efficiently, because improved rig mobility reduces the time it takes to move from one well location to the next, while reducing the overall surface footprint. A drilling pad is a location which houses the wellheads for a number of horizontally drilled wells. The benefit of a drilling pad is that operators can drill multiple wells in a shorter time than they might with just one well per site. Moving a drilling rig between two well sites previously involved disassembling the rig and reassembling it at the new location ("rigging down" and "rigging up") even if the new location was only a few yards away. Today, a drilling pad may have five to ten wells, which are horizontally drilled in different directions, spaced fairly close together at the surface. Once one well is drilled, the fully constructed rig can be lifted and moved a few yards over to the next well location using hydraulic walking or skidding systems, as demonstrated by Range Resources. In the picture above, each of the four drilling pads hosts six horizontal wells. Pad drilling allows producers to target a significant area of underground resources while minimizing impact on the surface. Concentrating the wellheads also helps the producer reduce costs associated with managing the resources above-ground and moving the production to market. Bentek Energy, LLC analysis shows that drilling operators are achieving efficiency gains in the well-drilling process. In June 2012, operators in the Eagle Ford shale formation averaged about 19 days to drill a horizontal well, down from an average of 23 days in 2011. Reducing the time it takes to drill wells can save oil and gas producers a significant amount of money. In the North Dakota section of the Bakken formation, the increase in drilling rigs in the area has begun to slow, but production levels continue to reach record highs each month. Recent studies by the University of Pittsburgh and Rigzone, as well as analysis of financial reports from E&P companies Abraxas, EQT, and El Paso, show that drilling costs alone are only a portion of the total drilling and completion expenses that producers face. EIA analysis of average Bakken, Eagle Ford, and Marcellus well-related expenses finds that total costs per horizontal well can vary between approximately $6.5 million and $9 million. The cost of completing and hydraulic fracturing typically exceeds the cost of drilling the well. One of the industry's more recent innovations, pad-to-pad moves, underscores the efficiency gains from rig mobility and pad drilling. During the drilling operation pictured below, rig operator Nabors Industries transported a fully-assembled drilling rig about one mile between drill sites. 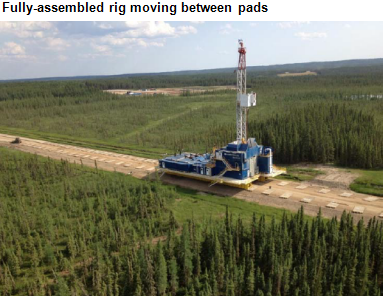 The cost of rigging down and rigging back up can be high enough that producers may find it more efficient to build a road between two pads, transport the rig intact, and have it arrive ready to drill the next well. Source: Reproduced with permission from Nabors Industries Ltd.